paperback, from the publisher and tlc book tours. Thanks! If you consider the combination of the action, size, and scope of this novel, you might agree that it reflects that old saying that everything is bigger in Texas. 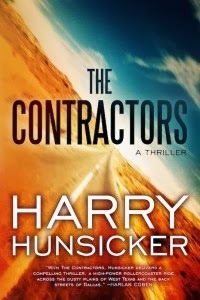 The Contractors is a hefty thriller, both in terms of number of pages and the nonstop, big-screen-sized action from beginning to end. While I'm personally not into reading thrillers, I wanted to read this book because it touches on one of my favorite topics: the spillover of the drug cartels into the U.S. The hero of this novel is Jon Cantrell, who had been fired from the police department in Dallas. To make a living, he becomes a contractor for the DEA. His girlfriend Piper is also a DEA contractor, “the new breed of law enforcement, the leaner, more efficient kind, what’s known in the trade as outsourced service providers, private contractors who work as public servants.” They are hired to make a bust in a warehouse, but Jon makes a big mistake and the bust goes south as members of another DEA-contracted agency swoop in. After the smoke from the gunfights clears, Jon and Piper are left with nothing except for possibly being arrested for murder, as one lunatic contractor uses Jon's gun in a cold-blooded killing. There is a witness to the shooting who can clear them, and as it turns out, she is also a federal witness who needs to be delivered to the US Attorney before an important trial. Once they find her, the real action begins, as there are people who don't want them to reach their destination. The book is a long roller-coaster ride of shootings, deaths and explosions, pretty much everything par for the course in the thriller genre, so if you're into this sort of thing, this book has everything you can possibly want. It's also very twisty -- the plot turns on its head more than a couple of times with events that you probably will never see coming, keeping things very lively. There is no room for boredom here, and I did like the way that the author included "the inevitable alliance between the dark and the light," resulting in the moral grey zone that occurs when politicians make deals with the devil, probably something that happens much more often than we mere mortals realize. On the flip side, however, this book is w-a-a-a-y, w-a-a-a-y over the top in terms of credibility. There are a number of things throughout the story that hinge on coincidence; the competing teams of mercenaries was just a little much, and the several times when you think Jon and Piper are goners, there's generally some kind of deus ex machina to the rescue. Again, all standard thriller fare, but it really strains belief. All in all, The Contractors is what I'd call an okay escape novel, good for a few lazy afternoons of reading. If you look at reader reviews, so far they're pretty positive, so I'd definitely point my recommendation at people who love to read thrillers. Many thanks to TLC book tours. The Contractors tour continues; you can find the complete schedule at the TLC website.